California Buyers - stripped lowers are sent to California as "Long Guns" only. Please make sure the business name of the FFL you will be using is on your order. These limited-edition lowers are made using the most advanced aerospace manufacturing technology to produce the industries finest, forged Mil-Spec lowers. Our receivers are machined on a multimillion dollar, automated, manufacturing system which enables us to produce a product of unequaled quality and value. These forged lowers are quality made using material is 7075-T6 and are marked "PFG-15 MULTI" to accommodate most builds. The finish is black hard coat anodizing per MIL-8625 Type 3 class 2. Will more of these be made? Nope. It was s limited production run. Is this lower transferred as a rifle or pistol? BEST ANSWER: Neither. Receivers can be built into whatever you want them to be, however if initially build as a rifle it may not be converted into a pistol. Does anyone make a .270 Winchester semi-auto build kit in the AR platform? BEST ANSWER: It would have to be a completely custom build, including the upper/lower, since .270 Winchester is based off the .30-06 and is too long for standard AR-10 mag wells. A .270 WSM (Winchester Short Magnum) might work in an AR10 receiver, if you could get a custom barrel & bolt that could hold up to the higher pressures of the .270. Would still be kind of sketchy though, since both .270 and .270 WSM usually have a lot higher pressures than 7.62 NATO/.308 Winchester (the usual AR10 caliber). Standard lower with a fun roll mark. Mine is under a blem PSA .22LR rifle upper and runs great. Lower parts are a PSA MOE kit. Everything fit and no problems. And it has POOP in the s/n! PSA stepped up to the plate with a high-quality, limited edition, customer lower for a reasonable price. The PFG then spawned a continuing series of custom lowers that is sure to make any AR built with one special. 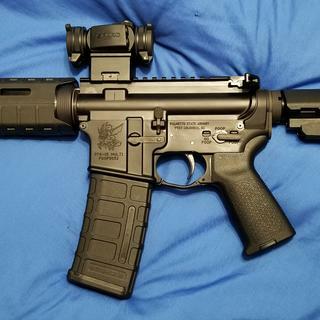 Got this lower on an AR15.com group buy. Fit and finish are 1st quality. Wouldn't hesitate to buy other PSA lowers. Thank you Hebrew_Battle_Rifle! If it was not for your bashing PSA we'd never have gotten a lower to celebrate your idiocy. We'd also not have the lower of the month without you. This lower is fantastic! Love PSA! First and foremost, it's a high quality lower receiver. Second, and nearly just as important, I like the meme. 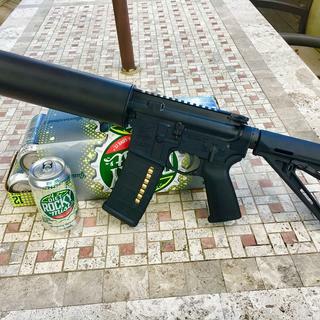 This plus Palmetto’s 10.5” 5.56 upper made a 5.6lb pistol. Luv it!!! Love my poop flinging gremlin! I love this lower! Everyone gets a real kick out of the poop flinging gremlin. 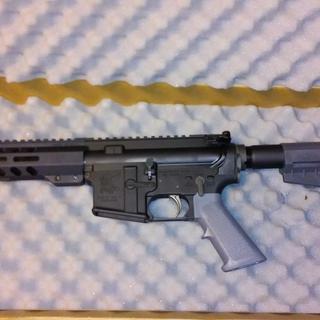 Building a 300 BLK with it, so I haven’t shot anything yet. But so far, the finish is really good. Not aware of any other companiy that could have pulled off this project with the amazing success that Palmetto State Armory has done. Awesome limited edition product at an extremely reasonable price point. Hats off to PSA and their customer service team! What's not to love about a PSA limited edition lower! This lower flings poop better than any lower I've ever had. I'm in awe at the poop flinging goodness PSA has made for us. Great to be a part of this limited edition run. Can't wait for the others. Love my PFG! PSA is awesome! This lower allows me to fling poop faster than ever before. It's deadly accurate with corn core ammo. One should never poop post on a gun forum about PSA. One must also never call people illiterate poop slinging gremlins. It gives birth to the unholy. The most poopiest flinging unholy in the world. Stand and behold the might of the Gremlin Army! For poop was slung, and it was met on the battlefield and obliterated by an army of poopslingers. Long live the poop gremlin!